How you interact with your smart home is one of the most important elements of a system. If the lighting, heating, security and entertainment systems are all working beautifully but your control system is causing problems, it can render the whole system ineffective or unusable. Smart home controllers can typically be broken down into five groups. Each controller is suitable for specific functions and many will contain a combination to give you complete control over your home. Crestron and Control4 wall mounted touch panels mean you don’t need multiple controls for the different systems in your home. They’re quick and easy to operate and, unlike a phone, can be used instantly as you don’t need a passcode to access it. Smartphone apps are convenient and help you manage your home from anywhere in the world. They can carry out the same functions as a wall mounted app but may occasionally be difficult to use because of the limited screen size. Just like a smartphone, tablets can be used for all aspects of controlling your home without the restriction of a small screen. Smart remotes aren’t essential as you can control everything from a tablet or phone. 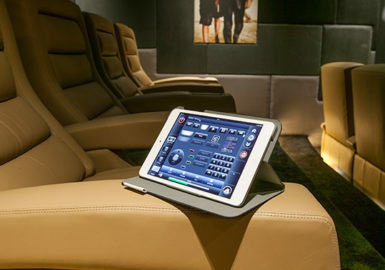 However, they are useful for rooms with a TV as you can control the channel and sound. A good smart remote will be used frequently and is also useful when you have guests who are choosing what you watch! Voice control is a relatively new and fun way of operating key functions in your home. These are complementary technologies and, currently, aren’t flexible or robust enough to be the only control in a smart home. Voice activation can be used for major rooms functions like “welcome home” to activate heating, lighting and TVs or “lounge evening mode” to turn on the fire and dim the lights for a cosy atmosphere.